As any good field guide will confirm, Montana encompasses significant portions of the breeding ranges of several specialties of the northern Great Plains: Sprague’s Pipit (18% of breeding range in Montana), Chestnut-collared Longspur (32%), McCown’s Longspur (41%), and Baird’s Sparrow (27%). Given that large areas of grasslands in the Great Plains continue to be lost to agriculture and other forms of human development, how are these species faring in the long term? As it turns out, not well: Sprague’s Pipit and Chestnut-collared Longspur are globally imperiled (listed as Vulnerable and Near Threatened, respectively, by the International Union for Conservation of Nature), and McCown’s Longspur and Baird’s Sparrow are species of concern in several states and provinces, including Montana. The Breeding Bird Survey (BBS) is one of the best ways of measuring population trends of these species, and the results are not encouraging. Considering data pooled for all BBS routes within each species’ range, from 1966–2015 numbers declined by 3.1% per year for Sprague’s Pipit, 4.2% for Chestnut-collared Longspur, 5.9% for McCown’s Longspur, and 2.2% for Baird’s Sparrow. 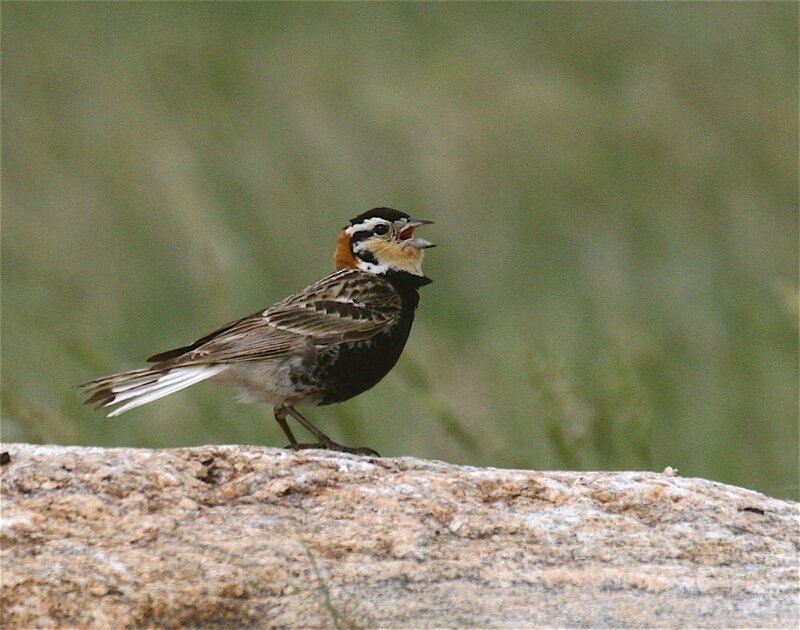 These downward trends translate to a drop in numbers ranging from 65% for Baird’s Sparrow to an astounding 94% for McCown’s Longspur over the 49-year sampling period. That’s the bad news. The good news is that these grassland specialists are doing relatively well in Montana. Indeed, as shown in Table 1, when examining the states and provinces with the best data for each species, in nearly every case Montana is the only locale with a positive population trend (Sprague’s Pipit and Baird’s Sparrow), or else the declining trend is the least severe (Chestnut-collared Longspur and McCown’s Longspur). The lone exception is McCown’s Longspur in Wyoming, which is declining at a slower rate than in Montana. These results suggest several things. First, a lot of work will be needed to prevent these iconic grassland species from disappearing. Second, in the context of the entire northern Great Plains, land managers and ranchers have been doing something right in Montana. Third, whatever we’ve been doing right (e.g., preserving native grasslands, managing grazing properly), we need to keep it up, and try to do even better! We should celebrate the fact that Montana has relatively healthy populations of grassland birds of high conservation concern. At the same time, we must be vigilant for proposed changes across the landscape that would be detrimental to their existence. 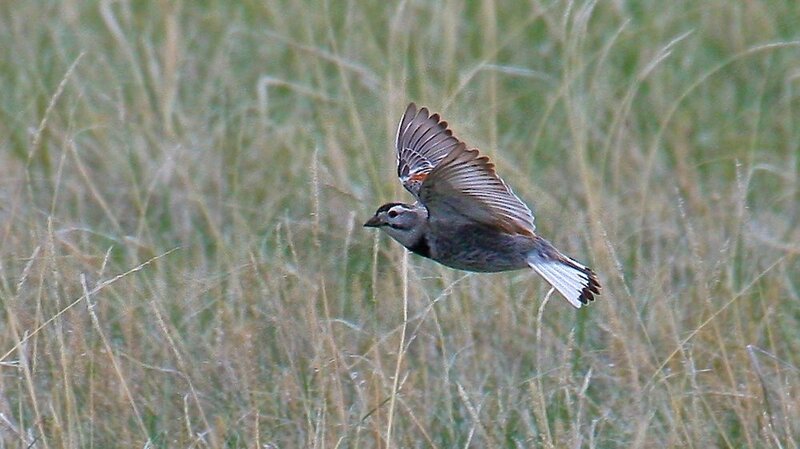 The Montana Bird Advocacy pledges to work with government agencies and other NGOs to keep the plight of grassland birds in the public eye. Stay tuned for information on how you can help conserve our grassland birds. More than 40% of the breeding range of McCown's Longspurs occurs in Montana (courtesy of Cornell Lab of Ornithology). 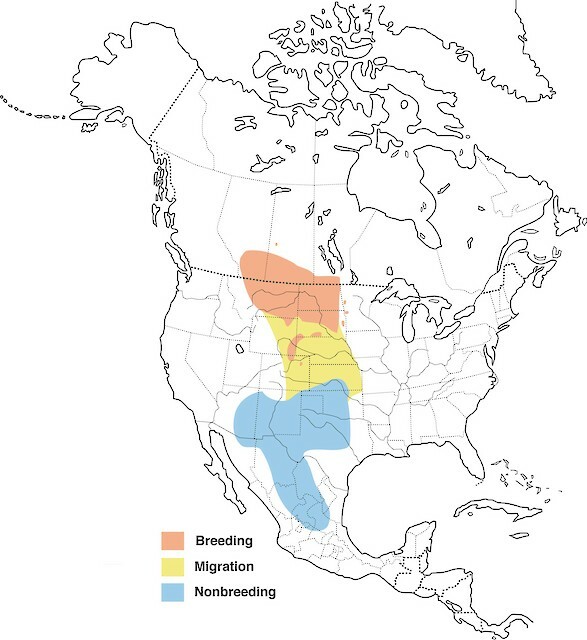 Nearly one-third of the breeding range of Chesnut-collared Longspurs occurs in Montana (courtesy of Cornell Lab of Ornithology).